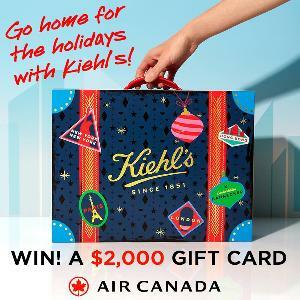 Enter now the Kiehl’s Contest for your chance to win a $2,000 gift card for Air Canada. Prize: There is one $2,000 Air Canada gift card available to be won. What you must do to enter: purchase any of the Kiehl’s Holiday 2018 Limited-Editions or Gift Sets at a free standing store location across Canada, or on kiehls.ca, each purchase equals an entry - not sure how they would know you purchased something? Statistics: This contest was opened by 70 and entered by 3 ContestChest.com members. 4% of those who opened the contest, entered it.